This is an introduction to the Plantronics CS510 wireless headset. There are actually two versions of the CS510. The standard CS510 allows you to have up to 38 units in one area without sacrificing distance or having any interference issues. There is also a CS510-XD model. It’s the exact same unit but on a different frequency, allowing you put more units in one area. The CS510 headset is a headband over the head with a speaker on one ear. It has a noise-canceling microphone. The headband is adjustable, and it has a temple pad, and that’s what makes the headset fit securely on your head. The microphone is bendable, so when you put it on, you want to bend the mic so it’s roughly a quarter of an inch away from the edge of your mouth. That way the microphone picks up your voice and is able to easily cut down on background noise around you. There are volume up and volume down buttons on the headset, and it also has a mute button. One very important button on the headset is a call control button. 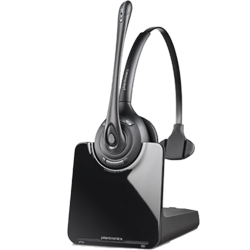 To clarify, corded headsets are great, they allow you to write and type while on a call. But when you go from a corded headset to a wireless headset, you take it up a notch and increase your productivity, because now you can roam your office while you talk on the phone. So you can walk to the cabinet to grab a file, or you can go and ask a coworker a question. So you’re able to multitask without running back and forth to your phone like you do now, because you can carry on that conversation with your caller and take care of what you need to within your office. There’s one other major thing you should consider, and that is the additional purchase of a lifter or EHS cable. When you add one of those devices to a compatible phone, it allows you to answer and hang up calls away from your desk. So now you take your productivity up another notch by being able to be away from your desk and not have to run back to answer or hang up a call. All you will need to do is push a button on the headset. You will also hear audio beeps in your headset when you have an incoming call, and you simply just push the button and say hello. When you’re finished with a call, you push the button, and it disconnects the call. You will really get the most out of your wireless headset investment by adding one of those accessories. The Plantronics CS510 is light weight at just 74 grams. It will give you 13 hours talk time, and an amazing 350 feet of range. So you can really cover an entire office with this unit. The CS510 will work well in a quiet environment, the average office, even up to a loud environment because you have the large leatherette ear cushion. You have a full-size speaker up against your ear, so it really separates the sound from what you’re trying to hear from your caller versus outside noise, and this separation is very important to give you the best possible sound quality. If you have questions on this or any other models, please give us a call at 1-800-914-7996, or visit us online at www.headsetsdirect.com.